Drew: This quote often comes up when discussing historical figures, but to my eye, it’s really all about the narratives we build around people. That is, this describes fictional heroes — from “chosen ones” destined for greatness to utterly reluctant nobodies that rise to the occasion — stories so familiar to us, we can’t help but project them on the world around us. But, like, what does it mean to be “born great,” and how do we distinguish that from someone having greatness thrust upon them? Those kinds of distinctions might make sense in stories where deities and magic put concepts like destiny in play, but the real world is much messier than that. Such is the case with Casey Solomon, whose greatness is anticipated by Forever Carlyle. Is her greatness inborn, or is it something she only achieved in order to live up to expectations? Part of the confusion here is that “greatness” is decidedly vague. Is it about outcomes or expectations, is it about the person in question, or the things they ultimately accomplish? 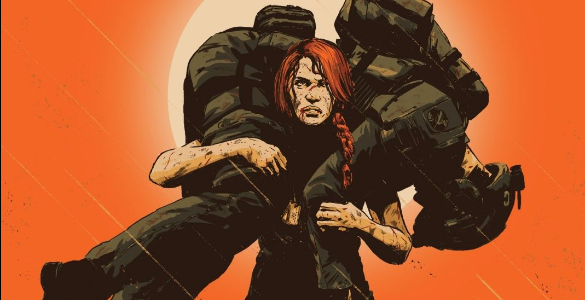 For Casey, the question is all about her capacity as an elite soldier. But again, what does it mean to be an elite soldier? Throughout her training at the special warfare center, she demonstrates impressive abilities — marksmanship and tactical skills are highlighted in longer sequences — but her compatriots are, at least initially, more concerned with whether she’s earned the privilege of even training with them. Which is, of course, by design. She’s the only one who was ordered to report for selection — by none other than Forever Carlyle — so her drill instructor does everything he can to make it harder for her. As far as Hackett is concerned, there’s no such thing as being born great, or even someone having greatness thrust upon them — greatness has to be earned, and Casey is already behind the curve on that front. But, of course, Casey surpasses those expectations, in turn living up to Forever’s. But where do those abilities come from? What is it that makes her able to calculate parallax and mil in her head, correcting for her partner’s (intentional) miscalculation? What is it that makes her able to lead her unit through a live fire simulation when her peers are so easily overwhelmed? Did Forever see something innate in Casey that makes her good at these things, or did the act of suggesting that she did make Casey want to be good at those things? I’m partial to the latter option. The explanation that she’s simply good at soldiering is both unsatisfactory and fails to reveal anything about her as a character; it amounts to, basically, “because.” A much more interesting explanation is that she’s simply more determined than her fellow soldiers, perhaps because of the encouragement/expectations set by Forever’s orders. I’m reminded of a great conversation Malcolm Gladwell had with Radiolab‘s Robert Krulwich about the nature of “genius” — specifically, whether geniuses are defined by “rare ability” or by “extraordinary love [for their subject].” To Gladwell, saying that Wayne Gretzky is great at hokey because of his “rare abilities” is an incomplete explanation, because it doesn’t address where those “rare abilities” come from; instead, he advocates that what really made Gretzky great was his “extraordinary love” for hockey, that his enthusiasm for playing, practicing, and thinking about hokey gave him a leg up on his peers who didn’t have that same “extraordinary love.” In a way, it comes down to heart, though unlike a Rocky movie, it’s more about the resolve in the years and months leading up to the big fight, rather than the amount of determination on the night of. With this in mind, I’ll suggest that Casey outpaces her peers not because of inborn abilities or in-the-moment determination, but because she’s been more determined to be great for longer than they have. Whew. Sorry to turn this into an essay on the provenance of genius, but I think understanding the nature of Casey’s talents are essential to understanding her arc here. She was destined to be great because Forever suggested she was, in the same way that she was destined to be reviled by her peers because Hackett suggested that she should be. Lazarus isn’t a story about any prophecies other than the self-fulfilling kind. Geez, Ryan, I got so into making that point, I utterly neglected to address Steve Lieber’s artwork in this issue. 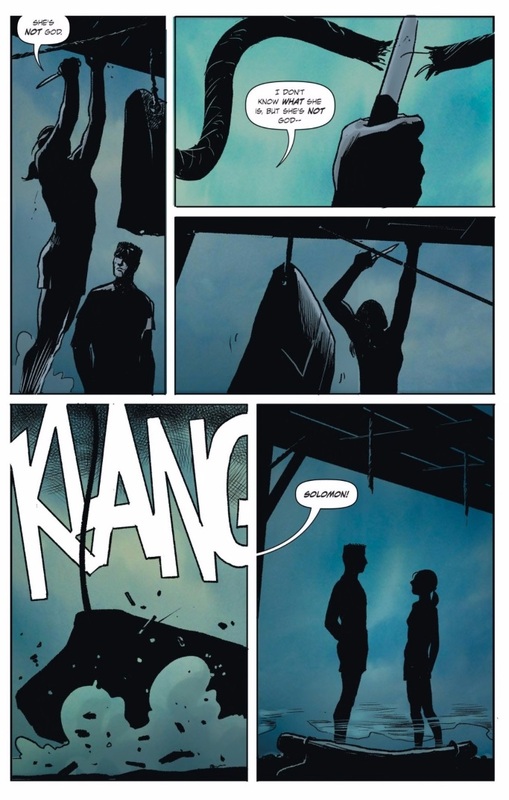 Seeing a different artist tackle narrative sequences in the Lazarus universe offers an interesting study in how an artist’s storytelling sensibilities change the feel of a book. This still felt very much like a Lazarus story, though Liber makes a number of directorial choices that feel very different from anything Michael Lark might do. I was particularly drawn to the sequences where Lieber chooses not to move his “camera,” holding a similar shot to pace out a moment. It’s an approach I’ve seen Lieber use to great effect in pacing jokes for his work with Nick Spencer, but it takes on a decidedly different tone in this issue. Did any of those moments jump out to you? Ryan D: Drew, I love it when you go all the way down into the rabbit hole! Before I get into the art, I’d like to join you down there for a bit. Whether or not I agree with you on the root of Casey Solomon’s “greatness”, I’d like to look at this idea of greatness not from your angle of philosophy, but instead within the context of the Lazarus universe. Since the wealthiest of families have replaced what we think of as governments while the rest of the population becomes serfs or Waste changes the idea of what it means to be special in this world. It’d be one thing to look at Solomon from the personal level as you did so well in your lead-in, but contextually, there are some large implications at work here. “You haven’t earned this.” But why not? Yes, as was stated, the road to the Dagger initiation process normally takes five years and Solomon did it within two, but she did so in a way I can’t imagine a fellow soldier disparaging. 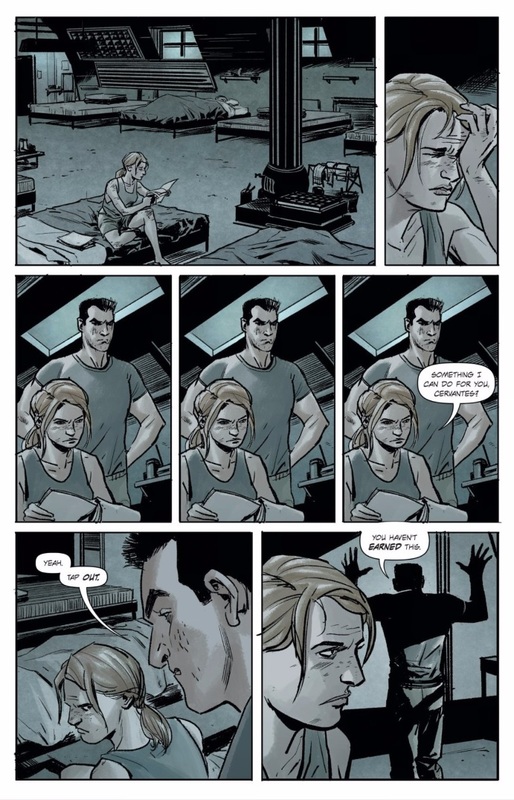 Let’s remember that Casey’s “calling up” came after she saved Forever and a hundreds of civilians from an insurgent agent’s schemes, sustaining a near-fatal knife injury in the process. Then, as a member of the Anvil company, Casey and Forever took out high-value targets under heavy fire, effectively saving the strategic value of Duluth. So what’s the real reason why Cervantes hates Solomon? While Rucka never directly states anything of the nature here, I feel comfortable assuming that some — if not all — of the animosity here stems from her class. 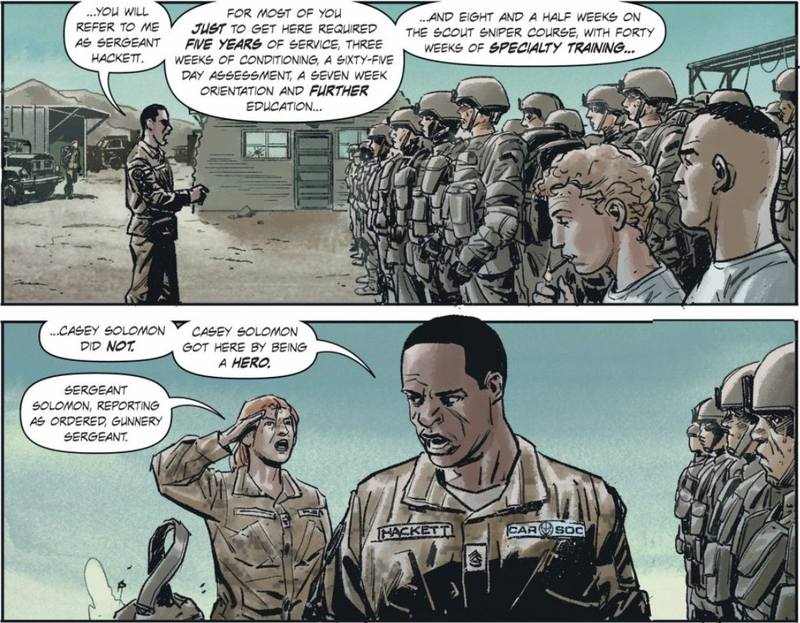 I am almost a bit surprised that Rucka didn’t hammer this home even more, but I am curious as to how many of the fellow soldiers aspiring to be Daggers came from serf backgrounds or were lifted from being Wastes. If that number is small, or if Solomon is the only, then there are some huge socio-political statements being made. This got me thinking: a feminist lens on this topic might make me say that it’s because Casey is a twenty year-old woman, and her femininity may be a factor; however, one of the team assessing the candidates is female, and so is Forever, their “god.” Races seem to be fairly evenly mixed here as well. Upon chewing this over, a startling realization came over me: for all of its dastardly faults, this neo-Feudal system in place in this future seems to have virtually eradicated institutionalized racism and sexism, reducing everything to good old classism – at least on the ground level. Kind of an odd thought to process for me, but hey: silver linings! Ultimately, I believe I agree with Drew that it isn’t Casey’s skills at all which make her special. Of course, Forever’s vote of approval plays a huge part in it, but the act which defines Solomon in this issue has nothing to do with Casey’s abilities, though it has everything to do with her upbringing as a Waste. When Cervantes tries to wash out as a candidate, Solomon stops him cold, committing an “act of sacrilege” upon the piece of A.P.C. armor which supposedly represents an important, foundational moment of the company’s lore. This deed shows her contempt and disregard for the absurdity of institution and iron will to stand by her own convictions- the same trait which enticed Forever to raise Solomon up in the first place after Solomon cussed out Forever, the Lazarus and representative of one of the most powerful political bodies in the world. Remember that the bond between the two women was forged due to the fact that “[they] both know what it means to fight despite the pain.” So, while I think it’s interesting to meditate upon the nature of greatness, the significance of it in Sgt. Casey Solomon lies within her beginnings as a Waste in a world which holds them as insignificant and common. Which finally brings me to Steve Leiber’s art! Like you said, Drew, I found it to be a bit unsettling to not see this title through Lark’s pencils, but thankfully we still have Santi Arcas on colors for aesthetic continuity. Plus, Leiber’s talents really work for the kind of story being told here. I know Leiber through reading The Fix, and his style really works for comedy – isolating what’s important in a gag, sending it up, and only focusing on what’s necessary for the humor and humanity of the moment. You see his comedic timing in those fixed camera beats you mentioned, Drew. A static camera allows a variety of comedic options has been utilized by directors for them from Buster Keaton to Edgar Wright. While Leiber may not be using these panels held in a steady shot for laughs, they are instead used for tension between two characters and to show a reaction or lack thereof. That’s Leiber’s forte: he uses silhouettes, physical motifs, and even exaggeration to tell the basic human story of the characters, and that’s the story this arc needs to be. After all, this is a “common” story, not mythology. The Daggers call the Lazarus god; Forever and her family may as well be, their estates serving as the Mt. Olympos upon which they scheme and machinate. From our view down here with Solomon, we’ll get to see whether or not being special means anything in a world with a stifling class system, or if it will all go to Waste.